We've teamed up with Peterborough-based Bumble Campers to offer one lucky Cool Camping fan the chance to win a week's hire of their incredible two or four-berth Toyota Previa campervans! Just a short hop from Norfolk and Suffolk, but also within easy range of the Peak District, the Yorkshire Dales and much much more, this centrally-located, family-friendly hire company are offering you the chance to get behind the wheel of one of their fresh, fun campervans and explore the best of the UK. Whether it's the open road of the coast or the tiny lanes of the countryside, adventure may be just a few clicks away. 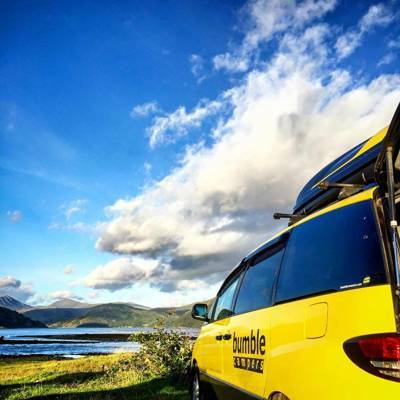 Taking play from the company name, Bumble’s easy to drive yellow and black Bumble Campers come complete with everything you need for your 2017 road trip. There’s a sofa that turns into a double bed, a table, sink, single hob cooker and powered coolbox along with on-board power when the engine’s not running. You can get creative too. The black detailing on the front and rear of the campervan is a blank canvas of chalkboard. Grab a stick of chalk and express yourself with some personalised artwork or a message... "I won this campervan with coolcamping.com!" The competition closes at midnight on 1st March 2017, after which we’ll pick the winner at random. Good luck – and please read the Terms & Conditions here before entering.